I've had quite a few people ask if I am doing my Christmas party this year....and the answer is: of course! 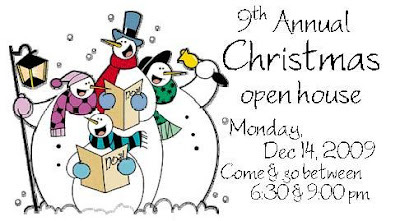 So, to get it on the calendars, here is the info..... if you live in my area you are invited, even if you don't get a formal invite in the mail. So, I told you here that I've joined the Fall Kitchen Cure hosted by The Kitchn. First assignment was issued on Oct 16....and I promptly left town. No, not to avoid the concept of cleaning out my fridge, freezer and pantry, but for ACU Homecoming. Emily really enjoyed running around campus before the parade and climbing up and down and up and down the stairs at Sewell Auditorium. Then she enjoyed running and dragging me all over creation at the football game. It was really fun. So, back to the assignment......I didn't get around to doing it until last night. My fridge and freezer were in pretty good shape, but one recommendation was to really assess spices and such for expiration dates and consider how often they are really utilized. So, I emptied several bottles that were many many years old and finished off a trash bag with stuff from my fridge. I have often wondered what happens to sour cream when it goes bad....does it get sweet? No, the answer is that it grows a lovely colony of mold as evidenced below. I almost dropped the container it grossed me out so much.....ICK!! and the pile of boxes for recycling! Assignment #2 was issued yesterday. We were instructed to de-clutter kitchen tools and gadgets. Now, I'm a gadget junkie, so this was actually a really good thing for me to do. Here are the de-cluttered items.....anyone want to claim dibs before these get shipped off to Goodwill?? 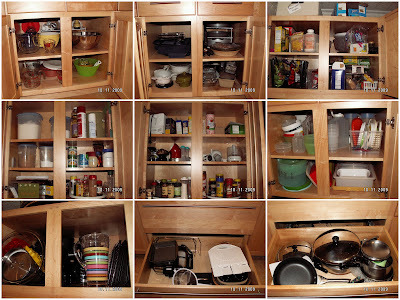 and after photos of two cabinets that housed a lot of these items.....the before/afters on most of my cabinets are really hard to see progress because everything was pretty neatly organized. but there is lots more wiggle room now. I think that is enough for now....if you stuck with me this long....thanks! Let me know if you want or need any of my stuff to come live at your house! So, I'm finally getting something done with my front flowerbeds.....a few months ago I called Brad and he came and pulled out all the holly stumps (remember the bushes I showed you that I conquered way back in May?). And this week we were finally able to meet and start on a plan. I have been getting home close (or past) dark the past couple of days, so the pictures aren't the greatest, but I can't not take in progress photos. First, down came the side fence/gate - it was very sad and hard to use. So we are replacing that small section. Marking the spot for new front bushes.....Brad is going to be able to transplant some dwarf yaupons (I think) from another client that is pulling them out. So, about half price for me. Yay! and some of the bushes, just hanging out, ready to drop in the holes! I subscribe to a number of home themed blogs....to see how other people decorate, to discover fun new crafty/thrifty ideas, to learn how to do new things.....one favorite is the Apartment Therapy group of blogs. 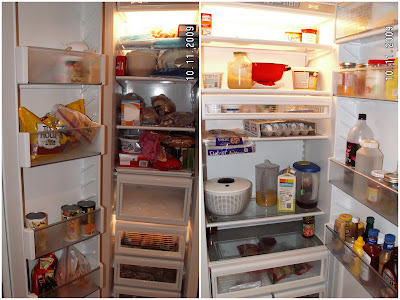 The Kitchn is focused on....you guessed it, kitchens....recipes, organizing, etc. They are hosting a Fall Kitchen Cure and I've decided to participate. 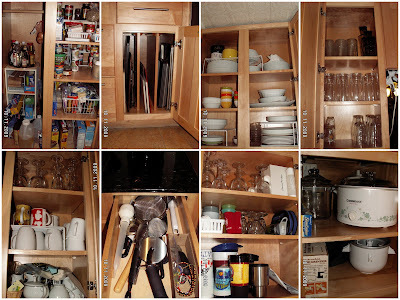 I am blessed with a lot of cabinets and while I feel like my kitchen is in fairly good shape, I think I probably could stand to get rid of some stuff. Hoping that the next four weeks of kitchen projects will be fun and help with that objective. Catching up a bit.....last weekend Heather & Emily came for a visit. It was so much fun!! The ACU Today magazine features pictures of alumni children in their free onesie that is provided by the Alumni Association. 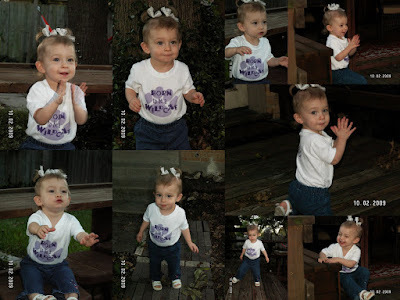 So Friday evening we got Emily dolled up and went outside for a photo shoot.....it was so fun! 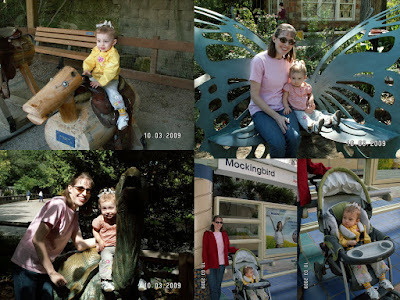 Saturday, we boarded the DART train and went to the Dallas zoo with some free passes that I got from work and enjoyed some beautiful sunshine and cool breezes before the rainstorms blew in. I think Emily had lots of fun....course it will only get more fun as she gets older and can really talk to us about what she is seeing! So, to today....nothing much on the agenda, except heading over to Ft Worth in a few hours for a wedding....still not sure what I'm going to wear since it is outside and it is CHILLY today! Might have to suffer for fashion. We'll see.